The other day I met G, a wonderful lady who lives in my apartment building. We live only a few floors from one another and yet we had never met before. 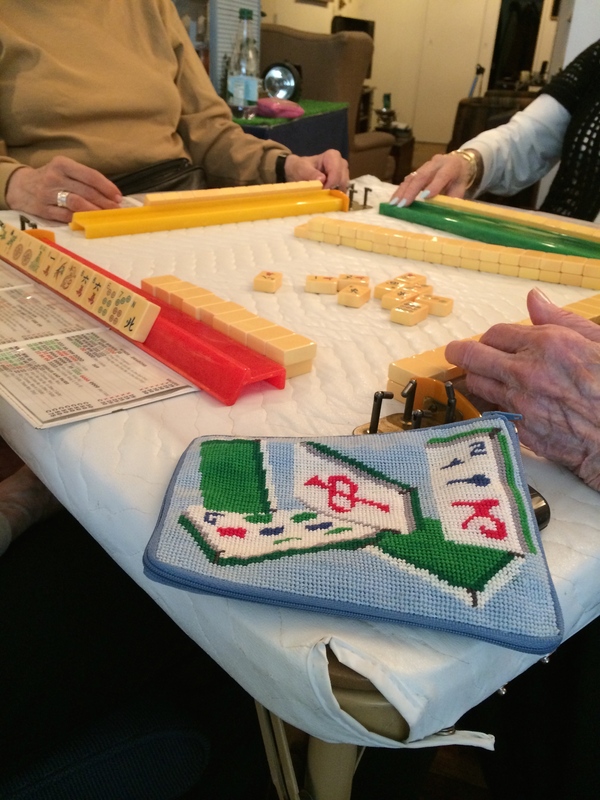 We sat and talked for a while and, much to my delight and surprise, she has been playing Mah Jong for over 50 years! She was on her way to a game right then but told me that she plays with a group on Sundays and they occasionally look for a fifth when one of their players can’t make the game. I let her know that I am usually free on Sundays and to please call me if they are ever looking for a fifth. 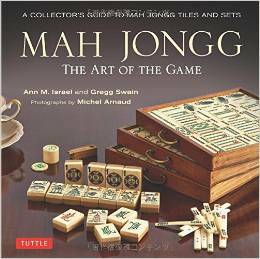 To my delight, G called me over the weekend and asked if I happened to be free for an afternoon of Mah Jongg on Sunday. I was thrilled and told her I would be honored to join her group. I love this bag – it holds money for the game and is large enough to hold the NMJL’s card. Fabulous! And what a beautiful job A did on this – every stitch is perfect. I was happy that basically these girls play just like we do when the OMs get together. 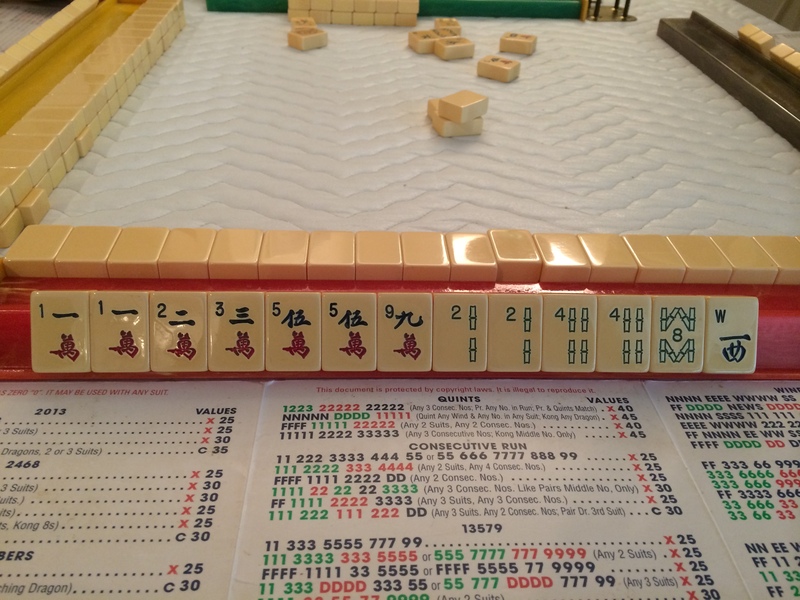 They do a “mish” (see Tom Sloper’s Table Rules in his definitive Mah Jongg book, The Red Dragon and The West Wind) although they only pull in three tiles from the wall and the OMs pull in five. Also, when the OMs play, we pool our winnings rather than giving them to individuals – sometimes we buy Lotto tickets and sometimes we just continue to collect the money for a future round of cocktails at some fabulous spot. Today’s group gives the money to the winner. I was up a nice amount of winnings by mid-day but by the end of the day I was out 75 cents. Actually not a bad day for me – I usually lose much more than that! 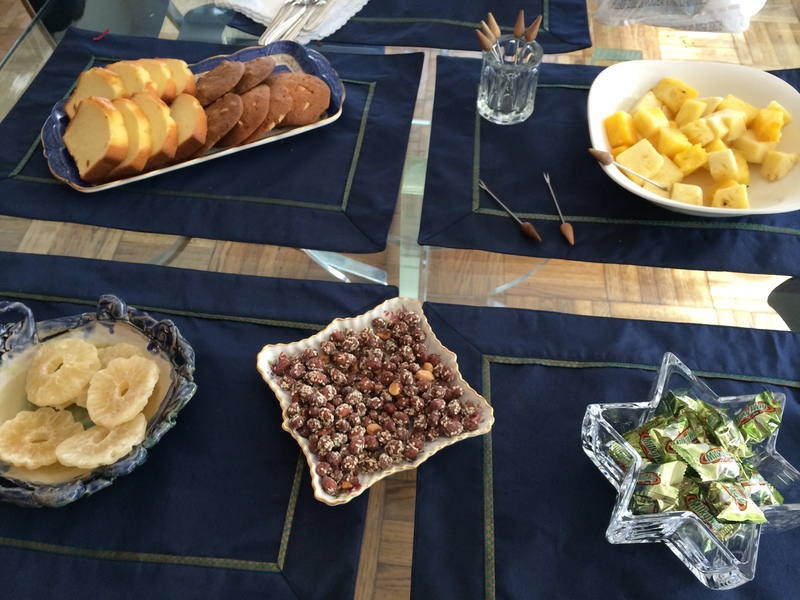 G had lovely snacks out on her table – lots of fresh pineapple that couldn’t have been more delicious, pound cake and fabulous salted caramel cookies, dried pineapple, yummy coconut and caramel-covered peanuts, and a big bowl of miniature Milky Ways along with a big pot of coffee. I watched the ladies play their first hand so that I could get a feel for their game play. 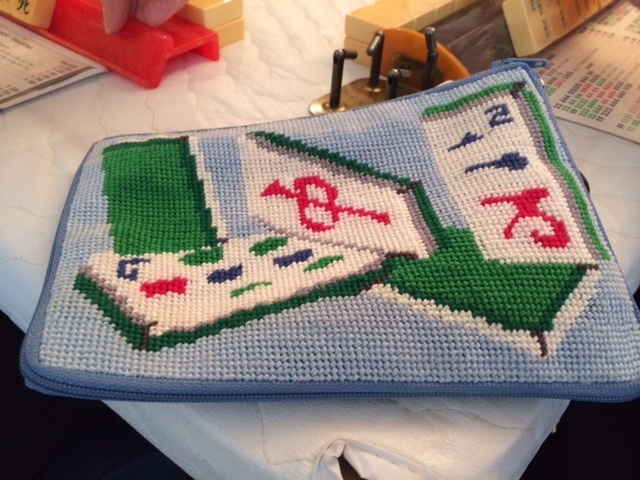 But I really couldn’t take my eyes off that creative coin purse that A had needlepointed! 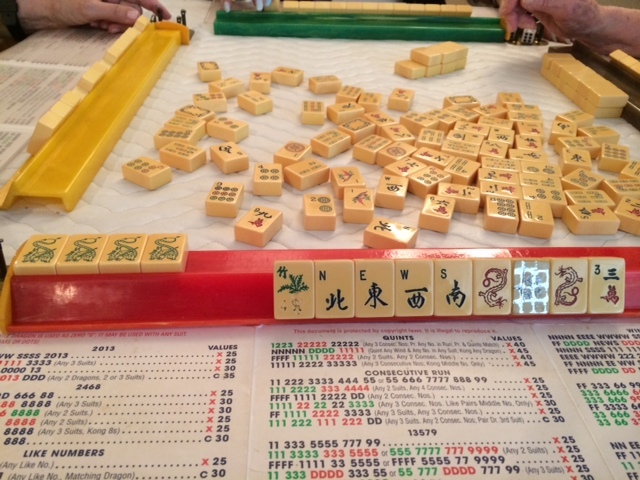 Also, I had to comment on G’s lovely Mah Jongg set – she told me that it had belonged to her mother! 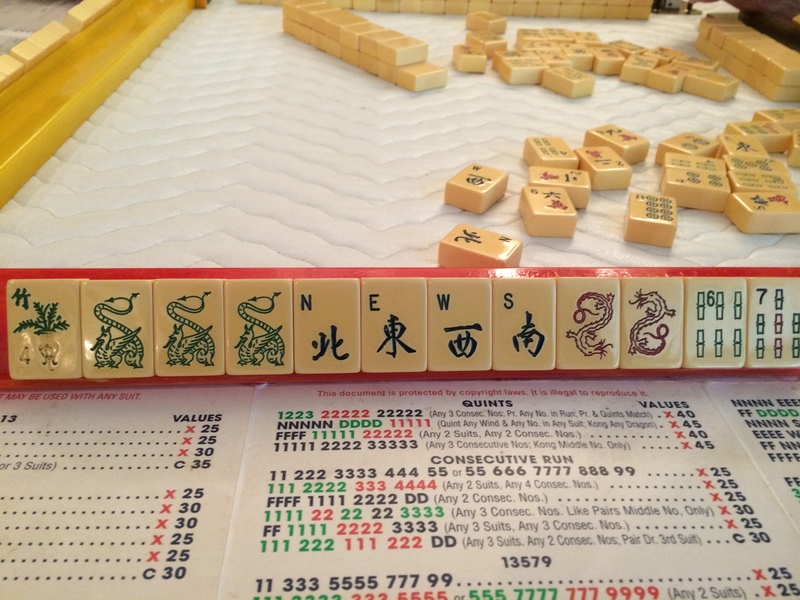 The tiles dictated which hand I would be playing right after the Charleston was finished (NEWS, Dragons, and Flowers). And even though I had no jokers I was still feeling quite optimistic to have these tiles so early on. 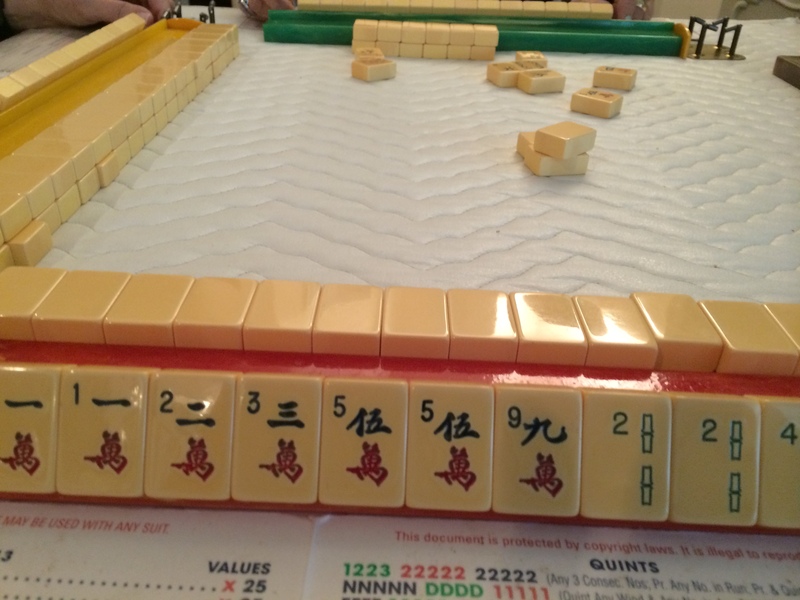 During my next turn I picked another Flower and was only one tile away – one more Red Dragon – from winning when G declared Mah Jongg! Oh, so frustrating! On this next hand I was debating between several different hands to play. Even though I ended up in the negative by the time I left for home, I must say that it was a wonderful introduction to four really lovely – and so nice and welcoming – ladies. I hope to see them all again very soon. Much thanks to G for inviting me! 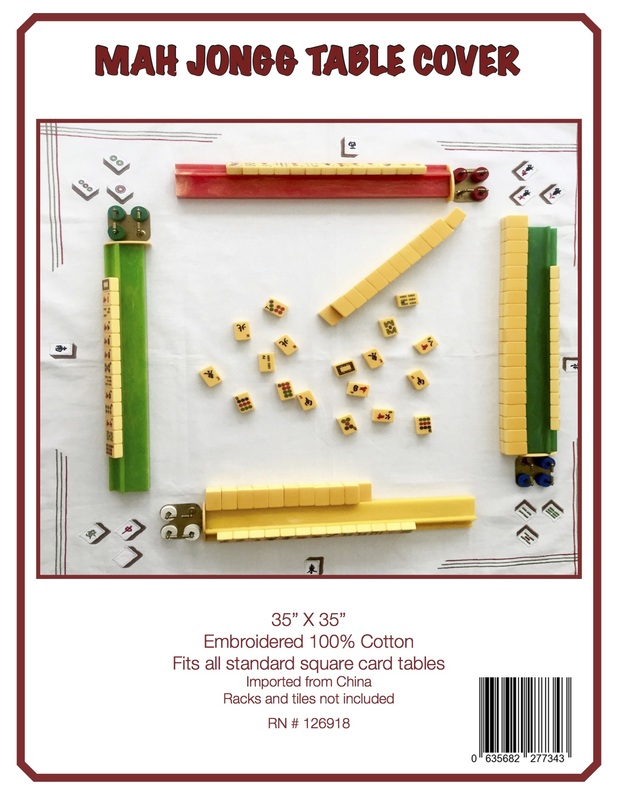 This entry was posted in Mah Jongg and Me and tagged mah jongg, mish, needlepoint, sloperama, table rules, The Red Dragon and The West Wind, Tom Sloper on March 24, 2014 by Mah Jongg and Me. Loved your blog today. Mahj is about so many things; winning, playing, schmoozing, friendship, food, mahj purses. excitement of almost winning — sometimes more memorable than a win. I would love to see a piece showcasing all the different mahj purses players use.